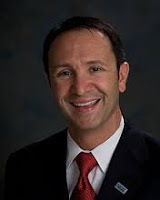 Jeffrey Martin “Jeff” Landry is the Attorney General of Lousiana, and a former US Representative for Louisiana’s 3rd congressional district, representing the Tea Party. As a representative, Landry made some waves when he accused the Obama administration of “granting special status or waivers to Muslims as they go through TSA screenings,” and then used that claim (madeup out of thin air) to argue that Christians should receive special rights, too, in other contexts, such as freedom to discriminate against gay people. In 2012, Landry made local headlines when he attacked the proposal to establish a minor field in lesbian, gay, bisexual, and transgender studies at the University of Louisiana at Lafayette, witing that “[a]s our nation continues to struggle with high unemployment, higher education’s primary mission should be ensuring current and future students have the tools necessary to compete in the 21st century economy.” This was not Landry’s actual reason for opposing the proposal. In 2016, Landry announced that his office would intervene to help any school that tries to defy guidelines from the Departments of Education and Justice letter on how Title IX protects transgender students. To support his position he repeated the utterly debunked claim that LGBT nondiscrimination policies have empowered child predators (they have a “tendency” to “create safe harbors for people who want to prey on children”), citing “research” by the tiny tinfoil hat fringe conspiracy group the American College of Pediatricians (no connection to the American Association of Pediatricians). Diagnosis: Wingnut conspiracy theorist with a proclivity for pseudoscience and making up things that he subsequently convince himself are true. Dangerous.